The success of the First Day Festival would not be possible without the dedication and hard work of so many. Thank you so much to the First Day Festival Planning Team, all exhibitors and volunteers, our School Supply Partners, and Honor Roll Partners. Your commitment to the Festival and to our community helped make last year the best First Day Festival yet! We've come a long way since the first First Day Festival in 2003. The number of dedicated volunteers, businesses, and organizations grow every year as does the attendance. Want to learn about how it all started? Click here to learn about past First Day Festivals and see how we've grown! 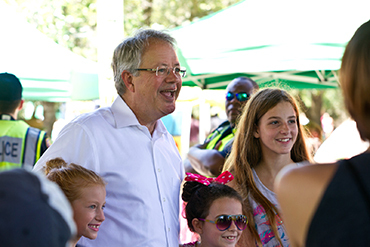 After weeks of rain, the 12th Annual First Day Festival welcomed the sunshine along with over 10,000 children and families. 63 amazing exhibitors set up at Liberty Square and the Maritime Center, giving away educational information, healthy living tips, and nutritional snacks to all who came. Close to 6,200 attendees also enjoyed free admission into the South Carolina Aquarium while 965 more hopped aboard Charleston Harbor Tours and SpiritLine Cruises for free boat tours. The success of the First Day Festival would not have been possible without the 250 volunteers who worked hard before and during the Festival. With their help, the City of Charleston was able to pack and distribute close to 4,000 bags of school supplies to children throughout the tricounty area. If the School Supply Drive, exhibitor activities, SC Aquarium, and boat tours weren’t enough, the Festival was proud to host three amazing performances by Japan Karate Institute, Flip! Gym, and LowCo Suzuki Guitar. While watching these talented groups perform, families were able to snap pictures with Cool Ray of the SC Stingrays and Scrappy of Patriots Point. When the Festival finally came to a close, children and families were prepared to start the first day of school along with our 85 Honor Roll Members. We thank everyone who participated in the 2014 First Day Festival and we hope to see you again next year! For more details on the 2014 First Day Festival, click here!